Earthquakes, cosmic catastrophe, as well as swirling tornados of fire and brimstone ; these are the typified ornaments and evidence of our worlds beginning and end. Yet, pop-culture’s deemed day of universal conflagration was met with upheaval by the innocent Indie compositions of the Oh! Pears: Variety Show. Corey Duncan, the former guitarist of Pattern is Movement, authored this show, which was comprised of nothing less than the love and tenderness between a nanny and someone else's children. I will disambiguate this performance in order to reveal how and why the rapture did not occur. I am absolutely sure that Oh! Pears is the reason that the fabric of time and space stays taught and stretched before us. We know the rapture did not happen...or do we? Disambiguation must start with a truth, which swallows and divests the plurality of experience. Thus, we must examine the form and the composition of this event in a similar way to translating the written notation of music to the performance of music. And we must put aside the idea for the thing itself in the presence of eternity. 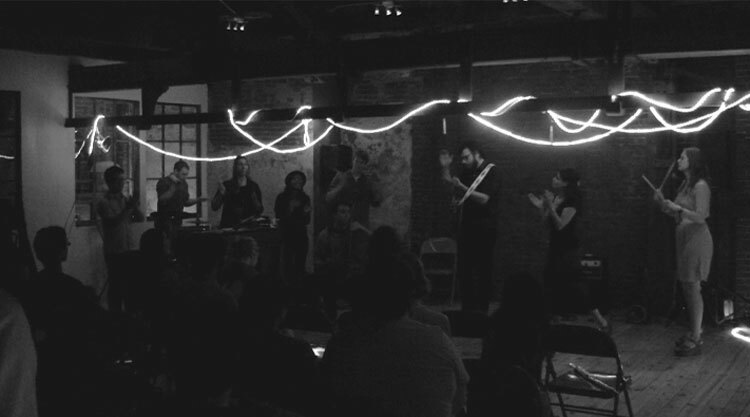 At the end of the world in a South Kensington warehouse, the Variety Show began with an improvised noise performance by Joo Won Park, a music professor at the Community College of Philadelphia. In the upstairs of the MAAS Building, Park sat on the floor with his legs crossed on a large dark blanket, redolent of a techno-gypsy living arrangement. He was surrounded by a plethora of electronics including a projector, a computer, a synthesizer, a sampler, speakers, and various found objects. On his lap rested a wooden board attached to a contact microphone and acting as a stage for the objects around him to be manipulated. Park captured the acoustic texture of the objects and transformed them into self-oscillating patterns of clattering, dissonant sound-scapes. The opening and scratching of an umbrella, a slinky, a hot wheels car, finger pianos, and doorstops became the rhythm and the tone of something ethereal and extraterrestrial. One might imagine the soundtrack to two aliens falling in love. The totality of the performance was captured with a web cam and projected behind him. It ran through a program that converted the image to ACII, which flickered and described the video in: ?><>/\][-=!@#$%^&*()….etc. The amplitude of the performance was also expressed in digital textures of rising and falling numeric values over the projected video. This was mirrored by the physical surface of the exposed brick of the space that the video was projected onto in such a way that each brick became a symbol and each symbol became a brick. Park acted much like the grey mortar adhering the various parts and elements of the performance. The performance seeped into space; a feeling akin to watching a Philip Glass film, when the soundtrack and the image collapse into each other. And then, as if the form could not become any more reflexive, at the end of each “song”, Park tenderly explained how everything was made. The audience suddenly became as a group of students watching eccentric science experiments. Oh! Pears followed Park's noise and shaped the MAAS Space into experiments in chamber pop compositions. Duncan assembled Oh! Pears initially as “a glorified solo project”, but it had since developed into an amorphous collective of roughly 13 members, seven of which were present. Corey's original material was progressed and refined with each new member added. 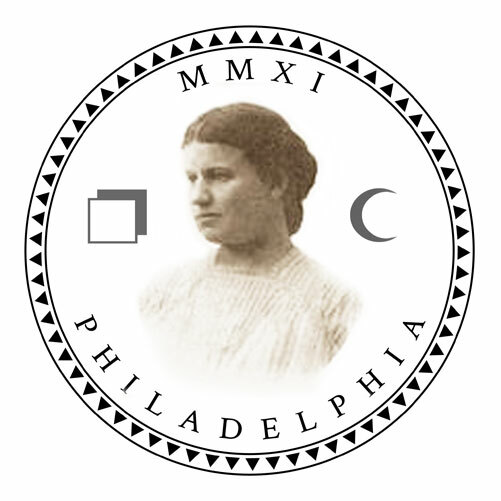 These members include Philadelphia based friends and friends of friends, as well as a couple former students of Girls Rock Philly (a summer music camp for young women held at Girard college and where Duncan’s wife instructs). Duncan plans to continue Oh! Pears solo after the day of the rapture. But on May 21, 2011 a capella arrangements were juxtaposed with lush multi-instrumental orchestral pop songs. Duncan expressed a desire to sound “un-mic'ed”, which was done successfully and provided for raw, acoustic wholeness- disallowing separateness between the music and the space. Duncan’s manifested intentions provided a certain kind of viewer-ship for the audience that was one of inclusively and unguardedness. Every song ended powerfully and was shy and genuine. Duncan, like Park, also explained the origins and content of songs as they were performed. The intimate setting acted as homage to the sweet and poetic pairings of the love felt and the love expressed by the musicians. To experience the music and the collaboration of the Oh! Pears: Variety Show is to understand why the perpetual motion of time is still felt beneath our feet and in front of our minds eye. Love and collaboration are simply the best tools to disambiguate the world and to rapturously interrogate the present and anything immediately ordinary. Histories of prophetic portrayals of tribulations are ordinary. To give meaning to our periodicity, we must look to the vibrations before us and participate in time.